Miss Kobayashi lives in a ordinary apartment, along with her new maid, Tohru…a dragon girl! Tohru despises all humans except for Miss Kobayashi, who she adores. Tohru works diligently to serve her beloved mistress, but there are a lot of little things that she can’t seem to quite get right…. 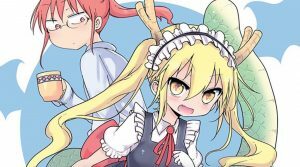 Take a peek into the daily life of a hard-working office lady and her inept dragon maid in this inhumanly delightful comedy!